Anne Firth Murray is the founder of The Global Fund for Women and shares her insights on leading a non-profit organization in Paradigm Found: Leading and Managing for Positive Change. Written in a highly accessible style, Paradigm Found spans the genres of memoir, manual, and motivational. Though based on her experiences with leading a specifically focused global non-profit organization, Murray's words transcend the separation between industries and sectors as she speaks to the need of a new style of leadership on a larger span. Murray describes the book as a "book for people who want success in making the world a better place and who want to be inspired by specific evidence that positive change is possible." She urges the reader to be excited and reassured by the fact that we are not alone in our desire to change the world for the better. Murray discusses many practical aspects of positive leadership throughout the text including leading by inclusion, self realization and actualization, the importance of communication, developing and staying true to your mission, effective succession planning, and knowing when to pass the torch.One of the most memorable statements is the way she describes the lifelong path of leadership. She advises spending the first 30 years of life gathering knowledge and clarifying beliefs, the second 30 years of life applying that knowledge to make the world a better place, and the next years still learning and supporting others by sharing experience and knowledge.Murray presents honest and valuable advice for business leaders. Believe that positive change is possible. Be good to yourself and envision the change; be true to your principles and learn; and be inclusive and value diversity. She encourages the reader to approach one’s life and work as a creative process, “holding a personal vision, committing to the truth, recognizing our connectedness to the world, compassion, and constant curiosity and learning.”She quotes Vaclav Havel, the former president of the Czech Republic, in saying that the “modern age has ended…. We are going through a transitional period, when it seems that something is on the way out and something else is painfully being born. It is as if something were crumbling, decaying, and exhausting itself, while something else, still indistinct, were arising from the rubble.” Violence and poverty characterize the world, and those in power use violence to maintain the status quo. Though her sentiment for change is urgent, her words stress the value of taking the time for thorough introspection, discussion, and inclusive collaboration. To her, the new paradigm of leadership is lead with respect, compassion, and connection. 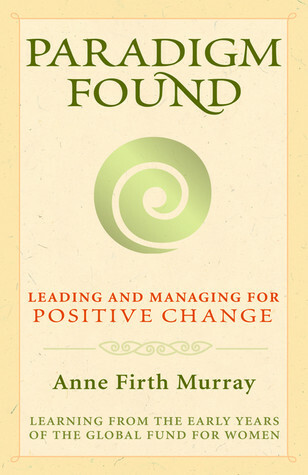 Anne Firth Murray has written a truly marvelous and thought-provoking book, straight from the heart:Paradigm Found: Leading and Managing for Positive Change. It is hard to classify as one particular genre or another. It is written in a unique style, defying categorizaion and capturing characteristics of a memoir, a good story, a motivational piece, and a manual. Not only did I enjoy learning more about the history of the Global Fund for Women [http://www.globalfundforwomen.org] and the wonderful, dedicated people who made it happen, but I also found it valuable to learn more about Anne Firth Murray's life and her struggle to incorporate the ideals she describes in her book into her work and every day life.It satisfies those who love good autobiographies and inspirational stories. And it also satisfies those who seek to learn about how one builds a strong organization from the roots up, from meaningful ideals to meaningful change. For me, this book was rejuvenating and energizing to read. It gave me new ideas and has inspired me all over again. I would think that each new reader who flips through its pages will experience similar self-reflection and inspiration in her or his own way.This is a treasure of a book. It is a great book for all to read--young and old, women and men, and people working in all capacities. Students and young people who are starting out in pursuit of careers in human rights or in non-profit work will benefit in particular from the inspirational guidance that this book offers. So far...a FIVE! I am reading right now!